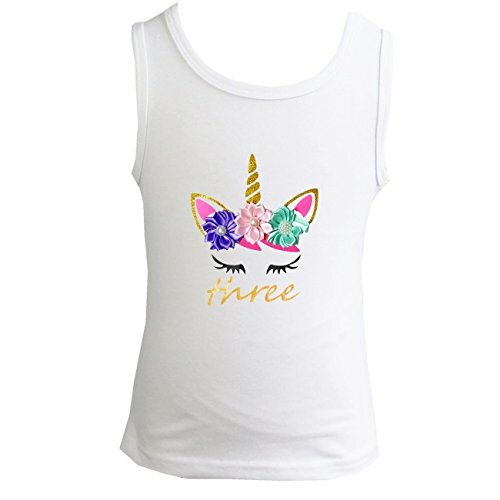 Kirei Sui Girls 1st - 5th Birthday Unicorn Top 110 Three | What Should I Say? High quality cotton shirt. So Cute!! Sizes: 120 16.5" Long (age 5-6) Chest is 22" - 23"
Sizes: 130 17.5" Long (age 6-7) Chest is 23" - 24"
Sizes: 140 18.5" Long (age 7-8) Chest is 24" - 25"
Sizes: 90 13.5" Long (3-12Mos) Chest is 18" - 19" Sizes: 100 14.5" Long (age 1-2) Chest is 20" - 21" Sizes: 110 15.5" Long (age 3-4) Chest is 21" - 22" Sizes: 120 16.5" Long (age 5-7) Chest is 22" - 23" Sizes: 130 17.5" Long (age 6-7) Chest is 23" - 24",Sizes: 140 18.5" Long (age 7-8) Chest is 24" - 25"
If you have any questions about this product by Kirei Sui, contact us by completing and submitting the form below. If you are looking for a specif part number, please include it with your message.